IPS has a few options for your lubrication needs; The old stand by is WD-40...WD-40 was first used to protect the outer skin, and more importantly,the paper thin "balloon tanks" of the Atlas missile from rust and corrosion. 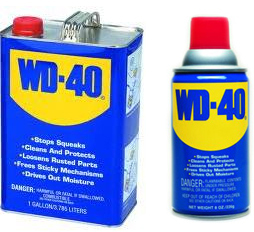 WD is an acronym for Water Displacing and 40 is for the 40th formula of theproduct that is still used every day. Preventing Rust and Corrosion are its primary function as well as Lubricating and was later found to have numeroushousehold uses. useful in both residential and commercial fields; removing dirt and residue, and extracting stuck screws and bolts are common usages,and it also loosens stubborn zippers. The product is useful in displacing moisture, as this is its original purpose and design intent. 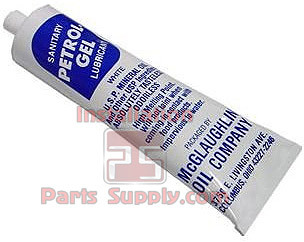 Petrol-Gel is the number one sanitary lubricant. Petrol-Gel can be used in a variety of applications, such as meat and poultry packingequipment, bakery equipment, brewery and distillery equipment, food packaging equipment, as well as fruit, juice. Petrol-Gel is the purest oflubricants, made with an odorless, tasteless high viscosity index paraffinic base oil.It is compounded with appropriate food grade additives to meet the performance demands for all recommended applications.Also, Petrol-Gel authorized by the USDA as a lubricant for use where incidental contact with food may occur. Gaskets, Seals & O-Rings and more.